This grilled chicken-on-the-bone is made extra tender and juicy through a simple brining process. Flavor layers build with the sweet and savory honey-mustard sauce and a basting technique while barbecuing slowly over indirect heat. Try this recipe with chicken hindquarters - they are easy on the budget and deliver maximum flavor. 1. 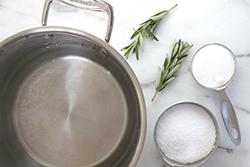 Mix the brine ingredients in a large pot until the sugar dissolves. Add the chicken and rosemary to the brine. Cover, and refrigerate for 3-5 hrs. 2. 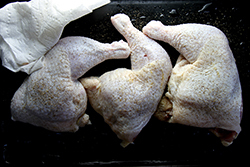 After brining, remove the chicken from the liquid and pat dry with paper towels. 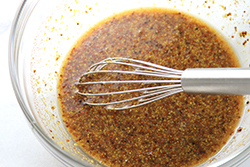 Sprinkle the chicken with freshly ground black pepper. 3. 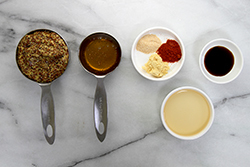 Make the sauce by combining all the ingredients in a small bowl. Reserve half the sauce in a separate bowl; set aside and serve with the cooked chicken. Use the other half of the sauce for basting the chicken during grilling. *Do not serve any leftover basting sauce; it's been contaminated with the uncooked chicken. 4. Fire up the grill! Set up a direct/indirect grill with one side of the grill at medium-high heat, and the other side on low heat. 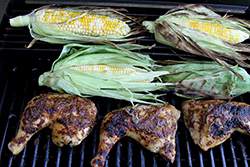 Once the grill is hot, place the chicken (skin side down) on the lower heat side for about 8 minutes on each side until browned. 5. 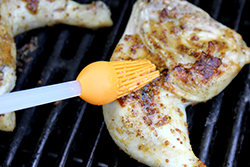 After the initial searing, use a long-handled basting brush to baste the chicken with the honey-mustard sauce. Continue to cook slowly on the lower heat side of the grill. 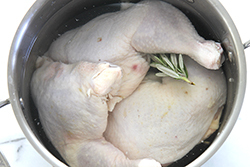 Baste and turn every 5-10 minutes until the chicken reaches 165 degrees F at the thickest portion of the thigh. 6. 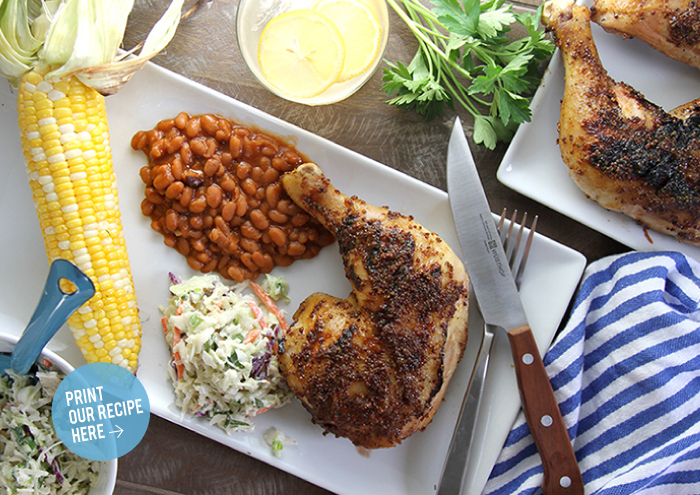 Serve with the reserved honey-mustard sauce and classic sides like creamy coleslaw, baked beans, and grilled corn. 1. Peel back outer husk layers -- leaving attached. Remove the silk and inner husk layers, then place the outer husk back around ear. 2. Soak the ears in a salt water bath for 10 minutes. 3. 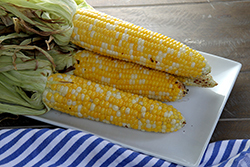 Place directly on a hot grill and grill for 20 minutes (turning every 5 minutes), until bright yellow and tender.